Presidio Park enables you to walk in the footsteps of California’s early European settlers. The popular attraction is the location where Gaspar de Portola and Junipero Serra constructed the San Diego Presidio and the Mission San Diego de Alcala in 1769. This fort and church, as well as the community that flourished around these sites, encompassed the first European settlement in the area now known as California. While the mission would later move further inland, the fort would serve as the capital of Baja California during the area’s rule by Mexico. Situated on a hill overlooking Old Town San Diego, the park features 40 acres of green open space, picnic areas, and memorials along with marvelous views of the surrounding landscape, including the San Diego River Valley and the Pacific Ocean. Although none of the original structures remain, the park was designated a National Historic Landmark in 1960. For centuries, the Kumeyaay inhabited the area before the arrival of Spanish explorers led by Juan Rodriguez Cabrillo in 1542. Soon after the construction of the mission and fort, the hill became the center of a growing settlement. After Mexico gained independence from Spain and the threat of attack subsided, the community abandoned the fortification. The site fell into ruin as materials from the fort were used to construct buildings in the community at the base of the hill. For much of the late 19th century, the hill remained in its undeveloped state. Because of the renewed interest in local history spurred by the California-Panama Exposition, affluent business owner and philanthropist George Marston purchased Presidio Hill in 1907 in an effort to preserve the historic site. Unable to garner public support, he built the park designed by John Nolen 18 years later with his own money. Marston also privately funded the construction of the Junipero Serra Museum. Built in 1928, the Spanish Revival-style edifice was designed by William Templeton Johnson. Marston donated the park to the City of San Diego in 1929, which was the 160th anniversary of the dedication of the original mission. The grounds of the Presidio Park are open to the public for leisure activities like play and picnics as well as small ceremonies. 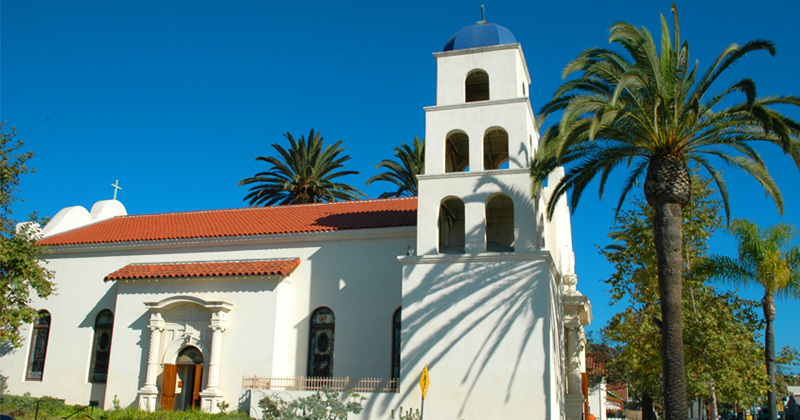 The iconic Junipero Serra Museum chronicles the history of San Diego. Exhibits feature artifacts collected during various archaeological digs at the site of the original mission and fort. Items on display include art, clothing, tools and furniture from the Kumeyaay people, Spanish explorers, and Mexican settlers. The spot where Serra planted a palm tree is a California Historic Landmark. The park is also the setting for a collection of historical markers, colorful murals, and statuary that commemorate the contribution that the Mormon Battalion made to the area in the late 1840s. The only religious-based unit in U.S. military history, the battalion helped the community build roads, dig wells and construct public buildings while it was stationed in San Diego during the Mexican-American War. The centerpiece of the memorial is a statue of a battalion infantryman designed by Edward Fraughton that was erected in 1969. The Arbor is a scenic patch of lawn lined with Corinthian columns featuring a semi-covered walkway. It is a popular spot for outdoor wedding ceremonies. A short wall surrounds an area of mounds that outline a part of the original fort’s foundation. A sculpture of a Native American by Arthur Putnam honors the Kumeyaay, the first inhabitants of the area. The Padre Cross monument was erected in 1913 using materials from the ruined fortification. A time capsule is interred near the statue of the priest. The park also has a series of nature trails that lead to scenic overlooks. Offering complimentary admission, the museum is open daily from 10 a.m. until 4 p.m. The museum accepts tax-deductible donations, which it uses to operate the facility. The public park is open from dawn until 11 p.m. Free parking is available in a lot situated off Presidio Drive at the base of the hill. The park is approximately a half-mile from the Old Town Transit Center. Along with several surface bus routes, the transit center is a stop on the light rail Green line. There are several other popular attractions related to early California history within walking distance of Presidio Park. A collection of preserved and reconstructed buildings that highlight the city’s history from 1820 to 1870. Visitors can step back in time to experience the era when Spanish, Mexican and American cultures coalesced in San Diego. Heritage Park features several noteworthy residential buildings, including many fine examples from the Victorian era. The district also includes the city’s first Jewish synagogue. Considered one of the most haunted buildings in America, the Whaley House was built in 1857. The two-story Greek Revival-style home has served many roles in the history of San Diego, including stints as a courthouse, a store and a theater. The building was the first brick home in the city. The Mormon Battalion Historic Site is dedicated to preserving the history of this storied military unit and the contributions that it made to San Diego. Docents in period clothing provide additional information about the interactive exhibits that include artifacts like uniforms, muskets, and cannons. Visitors can pan for gold, make bricks and re-enact life as members of the battalion.